The old parties love FPTP (First Past The Post). It can give them 100% control with a less than 40% of the votes cast. 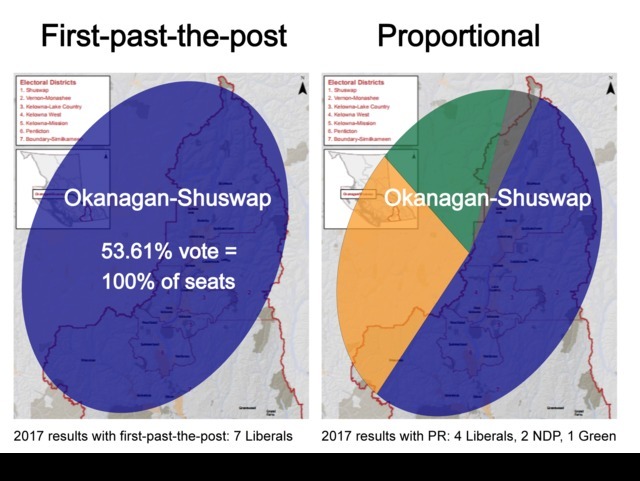 Depending upon voter turnout, they can get control of British Columbia with the support of less than 25% of the electorate. And we call ourselves a democracy? So they have much to lose, The opponents of proportional representation are using their tried and true tactics... fear-mongering and mudslinging. Two Cdn. political scientists, Dennis Pilon and Brian Tanguay have fact proofed the most frequently heard lies/misinformation about pro rep. Quick, easy, accurate information.